Gov. Malloy answers questions after a meeting of the State Bond Commission Friday. The State Bond Commission approved $22 million in financing Friday to help one of the nation’s largest hedge funds expand in Fairfield County. But Democratic state Comptroller Kevin P. Lembo, a potential Democratic gubernatorial candidate in 2018, joined with a prominent Republican state representative to oppose assistance for Westport-based Bridgewater Associates. 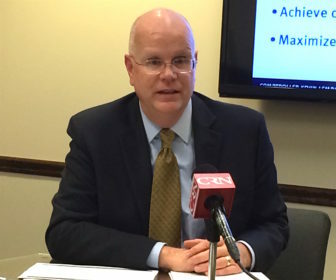 Both Lembo and Rep. Chris Davis, R-Ellington, argued it was imprudent to dedicate scarce state resources to a firm that manages more than $130 billion in global investments. Gov. 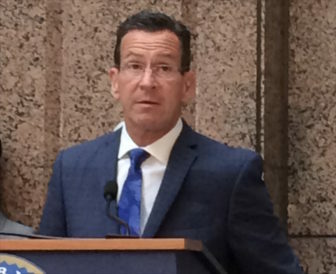 Dannel P. Malloy, who chairs the 10-member bond commission, countered that Connecticut competes daily with neighboring states for businesses and jobs. This $22 million investment — which passed 7-2 — will be matched with $505 million from the company and used to expand facilities in Westport, Wilton and Norwalk. It would help to retain 1,400 high-paying financial services jobs and add 750 more, the governor said. But Lembo and Davis said it isn’t that simple. “It is indisputable that Connecticut faces a new economic reality – one that warrants reevaluation of our economic development strategy, especially as the state faces ongoing cuts to services and the layoff of thousands of employees,” Lembo said in a statement issued after Friday’s meeting. State employee unions have criticized the Bridgewater assistance. Connecticut AFL-CIO President Lori Pelletier tweeted “well done” Friday to Lembo. At the same time Connecticut is preparing to borrow $22 million to assist the hedge fund, Davis noted, legislators are expected to cancel about $1 billion in financing for school construction, capital projects at public colleges and universities, and dozens of smaller, community-based projects. House Minority Leader Themis Klarides, R-Derby, raised similar objections earlier this week. Malloy responded that “we are in direct competition with other states bordering us” for the Bridgewater expansion, adding that he believes the company also was considering at least one location in New York’s Westchester County. The governor, who took heat in January after GE announced it was moving its global headquarters from Fairfield to Boston, used the loss of the company as a shield in this case. He noted that the state of Massachusetts and city of Boston provided more than $145 million in incentives to attract about 200 jobs away from Connecticut. That makes the Bridgewater assistance, he added, look modest by comparison. The governor also implied his critics, on both sides of the aisle, were playing politics. Republican legislators would be the first to complain publicly if Bridgewater announced it were leaving the state, Malloy said.